This article was writt by Anthony Ricaud, French OpenWeb enthusiast. A dynamic web application usually needs visual feedback from its inner mechanism or needs to display different visual elements based on users’ actions. To change the user interface easily, you can add/remove/edit elements through the DOM API (document.createElement, div.removeChild, elt.style.color, …) but it’s easier to just update the elements’ class attribute to change how they are displayed and styled by CSS. Let’s take an example. Suppose you want to display a form with two modes: a basic mode, and an expert mode with extra options. This can be done with CSS rules: each mode has its own class and set of CSS code. To dynamically change the classes of elements, you can use element.className. However, you may want to add, remove, or toggle just one class. There used to be two ways to do this, by using a library or by writing complex code with regular expressions. There is now another way with the new HTML5 API called classList, which is implemented in Firefox 3.6. Let’s see how it can simplify your code and improve performance at the same time. // Check that the classList contains the class "foo"
// Check if classList contains the class "foo"
Let’s go back to our initial example of a form with both a basic and an expert mode – check out the live demo to see it in action. See the Mozilla documentation and the HTML5 specification for more details on classList. 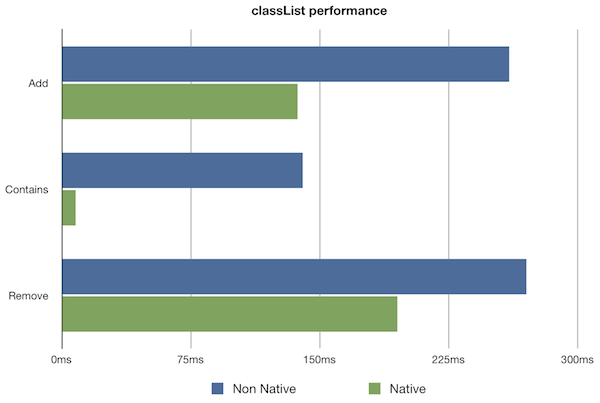 Using the classList API is not only easier, it’s also more powerful. Take a look at what we observed using Firefox 3.6. Since other browser vendors have not yet implemented the HTML5 classList API, you still need fallback code. You can use this sample code as fallback. The linked benchmark seems pretty useless; in particular it mostly measures how long it takes to parse very long class attribute values in the engine. Since the use case of setting or unsetting 1000 differently classes is not a common one, why are we testing it? Testing extreme situations can be very useful. If your feature works and is fast enough in extreme situations, you can be pretty sure it will perform in normal situations. Edwin, you would be right if the extreme case has the same bottlenecks as normal use. If it doesn’t, then it really doesn’t tell you much. Or put another way, I can speed up this “extreme case” probably by a factor of 2-3 without too much trouble without speedin up the normal case; in fact it would probably slow down the normal case. The point of this article is not the benchmark, it’s the new and easier API. About the benchmark, I agree that it’s not that representative of the usual case. But you can’t just use a normal use case to explain and show such improvements (the performance is here, but not noticeable enough). Exaggerating the test case is a good way to demonstrate the enhancement. But as Anthony said, the point of this article is the API which is way easier to use. Anthony, Paul, you could trivially write a benchmark that would be more representative of actual usage by simply adding to multiple elements, or timing add + remove on the same element or whatever way people will _really_ use this. If you can’t figure out a way that people would use it such that an improvement is visible, then the perf difference simply doesn’t matter. In the demo, when the additional elements are “hidden”, copying and pasting text selection that includes “hidden” area still contains “hidden” elements. Is this an unfortunate side effect or there is a way to actually hide the elements from copy/pasting? I’ve seen similar annoying side effects on commercial websites that overly rely on JS/CSS for no good reason. If you want it to work with copy/paste the solution is to add/remove that block from the DOM. That can be done fairly easily/quickly, esp if the block is nicely contained. However, I use display: none; all the time myself. I don’t really see this copy/paste issue as being that crucial for things I’m showing/hiding. In this case for example, I really don’t see why it should matter to you at all. And given the large number of hidden things on the web these days, scripts and other junk, copying large portions of page is guaranteed to pick all kinds of things up.